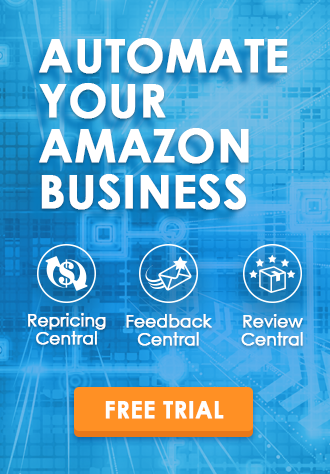 Whether you are jockeying with other sellers for the Amazon Buy Box or trying to maintain profitable margins in pricing wars with Amazon retail, the competition you face is tough and smart. The way to stay ahead in this competition is to be craftier, and one trick is to optimize your product listings for increased visibility. The key to this is to think like a buyer. Analyze how buyers shop online. How do you find what you want to buy? What are the searches you’d use for your product? The answers will give you a better perspective of your listing’s visibility. The title provides the first information about a product. I browsed around some more before I bought the second dress from the search result. As you can see, including great search terms in your product name and its description boost the overall visibility of your product listing. Your customer has to find your store before you can sell anything to him. Each individual word in the product name is a search term by itself. You should add as much information to your product name as possible, while staying within Amazon’s listing guidelines. Amazon provides specific formulas for writing product titles in each category. You have to follow the set style guidelines and have correct capitalization. Some categories restrict product titles to 80 characters while others allow up to 150. You start with the brand name and then list the product name. Your title is allowed to include other facets like the quantity, the color, the pattern, the model number, the power output, and the size. After the product name comes the product description. Make sure your search words are included here. But more importantly, put effort into writing an enticing product description that your buyer will not be able to resist. Amazon allows up to 2000 characters for product descriptions. Details are what make a product more visible and appealing to buyers. Amazon has many tools, which when utilized properly by sellers, make the difference between remaining mediocre and becoming a shining star. One such simple tool is for designating accessory products that will appear on the product detail page for specific items. Establishing accessory relationships between products can promote cross sales. Accessory products are made up of two types. Products that complement each other are said to have an accessory relationship while similar products that have a defined variation theme such as size or color are termed as a parent-child relationship. 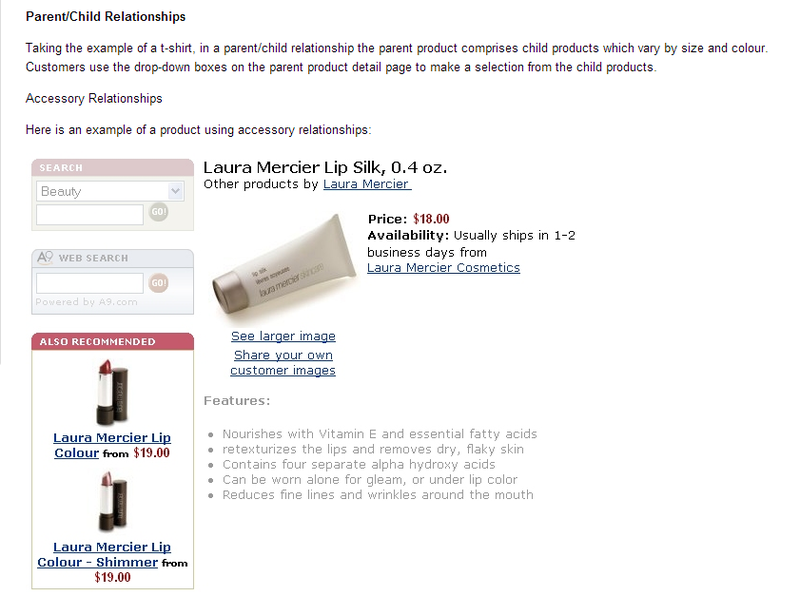 Many Amazon categories allow product detail pages to contain both relationship types. Check to see if relationships are an option for your product category. Drop down boxes can be added on the ‘parent’ product detail page to make a selection from the ‘child’ products. 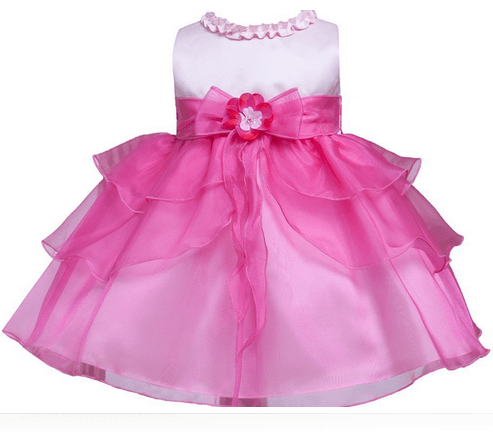 In such a relationship, a frock, for example is chosen as the parent product and its various color and size options become the child products. Amazon has another useful tool for this called the ‘Check My File’ feature which automatically detects variation sets in your inventory file. If an appropriate variation theme exists for your products, it is advisable to set up relationships between your relevant products. For products using accessory relationships, the suggested accessories can be given in the ‘Also Recommend’ box. Buyers can click on the boxes to view these suggested add-on products. In certain categories, Amazon allows products with accessory relationships to be linked in the ‘Item Information’ box on the product detail page. Listmania is an Amazon tool that allows you to create your own lists on just about any theme imaginable for promoting your products. It is a great way to raise your listing visibility by linking related products. 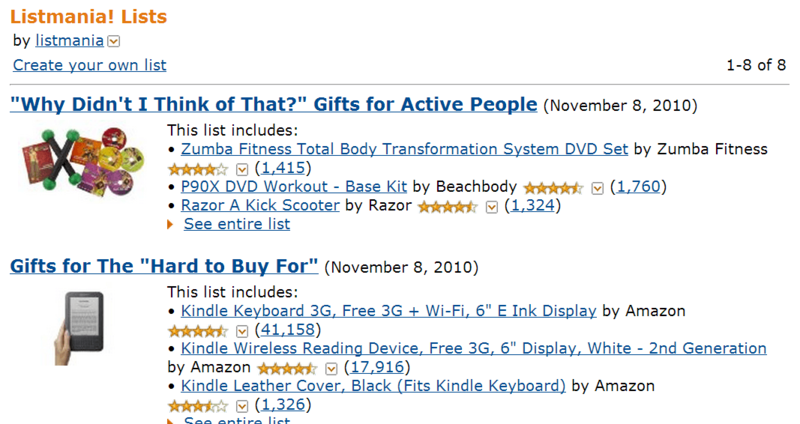 Though you cannot control the placement of such lists, they appear on relevant pages throughout Amazon. When the buyer is a few dollars short of the required $35 free shipping eligibility, such a list gives him some practical purchase options below $5. Listmania provides a great opportunity to cross-promote your product to increase sales. When your product compliments a popular product sold by another merchant, you can include his product in your list to get yours promoted indirectly. If your store is launching a new brand of protein powder, you can create a list called ‘The Best Selling Protein Powders.’ Put your own brand at the top of the list and add other similar, popular brands. Identify your competitors, their merchandise, pricing, and promotions to plan and launch compelling and effective competition. It is a good idea to mimic common characteristics of bestselling items in your categories without compromising your brand’s personality. Violations of Amazon’s listing requirements can result in suspension of listing privileges or cancellation of the listing itself. For accessory relationships in product listings, should you refuse to follow established variation themes, Amazon category managers may delete your listing. Similarly, every aspect of product listings is governed by strict rules. Amazon aims to improve the customer buying experience and to make it easier for buyers to find, evaluate, and purchase products. It would be wise to follow Amazon’s suggestions to boost your own listing visibility and sales. Yes all our products support Amazon US, CA, EU (UK, FR, DE, ES, IT). It’s truly a nice and helpful piece of info. I am happy that you just shared this useful information with us. Thank you for your feedback! Your support is our motivation. We will continue posting and sharing more information with you all. Thanks again! 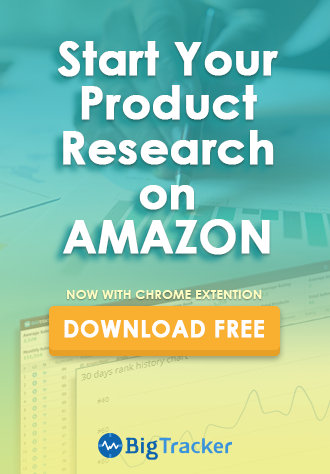 Being able to organically rank your products on Amazon is the number one marketing strategy you need to be using. The difference between your product being on page 1 and page 2 is immense. Usage of the right best keywords, is fundamental to increasing organic rankings in Amazon. If your keyword research is not up to standard, you will never be able to increase your organic rankings. PPC, a great way to boost organic rankings based purely on the quality of your keywords. If they work and you can see that your product moves higher up in the listings, great. Pump some more money into them to keep the ball rolling. Competition analysis, now you know what keywords you want to use, the next step is looking at the competition. When thinking about keywords you can use, you need to be aware of competition. For most markets, you won’t be the only seller, meaning that they will most likely be using the same keywords as you.